That's an idea I could get used to (my mother tells me this means I'm not ready to have children, but I think that JPG is on to something). Ensuring that even fashion obsessed females are included in the mega marketing campaign for The Simpsons Movie, America's famous cartoon family is featured in the latest Harper's Bazaar. They are, of course, in Paris and stroll around with Bart's favourite supermodel, Linda Evangelista. The illustrations are perfectly - and hilariously - accurate in detail with regards to clothing (fall 07 rtw) and characters. 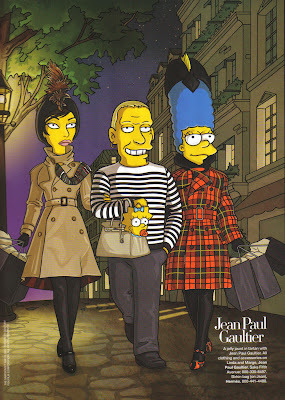 Maggie in a Birkin bag steals the show for me, but Marge with her hair down, and Karl Lagerfeld in cartoon form are both worth a look. Posted by la femme at 10:09 p.m.
ooooh, genius. i love it. Maggie in a bag reminds me of a former roommate of mine who sneaked a puppy into residence last year... and sneaked it out every day or two for walks in a bag about that size. Wow, this is awesome - great publicity! I just hope the movie doesn't blow as many chunks as I'm expecting it to.